OPSU's Wayne Stewart will wield the gavel as president of the Oklahoma Association of Colleges of Teacher Education (OACTE) for 2011-12. 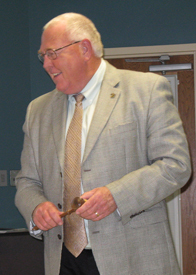 Dr. Wayne Stewart, dean of education at Oklahoma Panhandle State University, recently accepted the gavel as a symbol of the office of president of the Oklahoma Association of Colleges of Teacher Education (OACTE). He was elected unanimously by the association to serve as head of the organization for the 2011-12 term. Oklahoma's branch of the American Association of Colleges of Teacher Education (AACTE), OACTE is actively involved with members representing all colleges and universities in Oklahoma which prepare teachers. An active member of this association since 1997, Stewart will keep in touch with legislators, both nationally and statewide, coordinate meetings with representatives from the Oklahoma Teacher Preparation Commission, and oversee OACTE's website and publications, committees, and monthly meetings. He recently attended the AACTE's "Day on the Hill" in Washington, DC, where he took part in Leadership Institute 2011 and visited with Oklahoma legislators about issues concerning national and state teacher preparation. Congratulations to Stewart for representing Oklahoma Panhandle State University at the state and national levels.